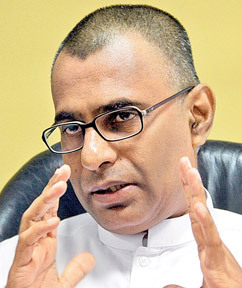 JHU front-liner Patali Champika Ranawaka says the Rajapaksas are plundering the country on a massive scale to fund their mega deals as the country is now bankrupt. Speaking at a common Opposition rally in Kirulapone on Thursday, Ranawaka listed out several development projects the Rajapaksa regime has been highlighting to showcase the progress in the country, in which large-scale financial misappropriations have been carried out. “The cost to lay the railway line from Beliatte – Matara has been estimated at Rs. 1430 million per km. At this absurd cost the railway line can be laid upto Beliatte in gold!” he remarked while adding unlike previous governments where the swindling of finances were only about 5 – 10%, theRajapaksa regime’s mega deal economy has pushed for the underhand deals to be 1000% – 5000% worth illegal commissions. Pointing out several similar cases, he said a commission of 510% has been swindled in the development of the Peliyagoda – Katunayake road where the construction has been priced at Rs. 1890 million per km. “The construction from Pinnaduwa to Matara was estimated at Rs. 2700 million per km – how much is the commission? 730%! But the swindling done off the Kadawatha – Kerawalapitiya road construction takes the cake! They have swindled a commission of 2000%, estimating the construction cost to be Rs. 7560 million per km,” he added. He went on to state that the Rajapaksa schemes are being justified and protected by Treasury Secretary, Dr.P. B. Jayasundara who spews lies on behalf of the government. “Today, the government runs the country off loans taken at a 7% interest rate and that money is being used to pay the salaries of state sector servants, pay pensioners, maintain state sector offices, fund development projects and give out Samurdhi benefits etc. . . but who foots these bills eventually? It is we who would be forced to pay for their extravagant schemes steeped in bribery and corruption,” he added. He also pointed out that although the price of petrol and diesel has drastically reduced in the world market, the government does not reduce the prices relatively as the money is being pickpocketed to fund their schemes. “A barrel of petrol in the world market is 74 USD. It is imported today at Rs. 63 per liter and a sum of Rs. 80 is pickpocketed off every liter by this so-called ‘sensitive’ leader. The same goes for diesel – a sum of Rs 45 is looted off every liter by the Rajapaksas,” he said. However he added that under the leadership of common Opposition candidate Maithripala Sirisena, they would take measures to lift the import taxes off diesel and petrol within 100 days of being elected.